When you learn how to cook Swiss chard you should first know a little about this vegetable. It is a member of the stalk vegetables meaning that it is plant stem. It is high in cellulose fibers (or strings) that are necessary to hold the stalks upright under the weight of the leaves and buds. Delicate Swiss chard is plentiful from June through October. It is characterized by large leaves which are often treated as a separate vegetable. Chard and other stalk vegetables should be firm, clean and free of deteriorations when purchasing. When learning how to cook Swiss chard, learn when shopping to avoid signs or age or improper handling. The ones with coarsely thin parallel lines of the stalks are old and pithy. The ones with limp rubbery stalks or yellow brown wilted leaves have dried out and lost the flavor. Over chilled and tasteless vegetable may appear to have brown spots and slippery. Learning how to cook Swiss chard correctly means cooking it as soon as possible after the purchase; do not store for over two days. After two days of storage the water evaporates from the stalks. Do not wash it until ready to use; any moisture left on the vegetable will hasten the decay. Cleaning is important before learning how to cook Swiss chard. The first step is to wash it thoroughly in fresh cold water. The chard may collect grit in the folds so make sure they are clean. Cut off the leaves before cooking; they are good served with the stalks or by themselves. The leaves cook very quickly compared to the stalks so the time varies for them. 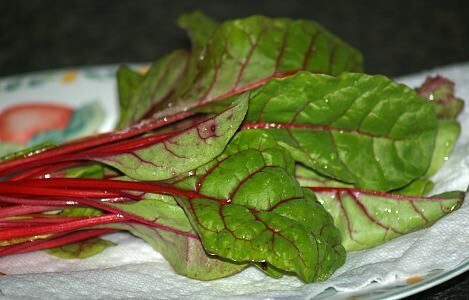 If you choose to cook the chard leaves, trim them by cutting out the middle rib from each leaf. Cook the leaves briefly by plunging them into boiling water; once the water has returned to a boil, remove and drain immediately. The stalks have a transparent membrane which needs to be removed. Once this has been done it can be cut into pieces to cook. When you learn how to cook Swiss chard this is a very simple recipe. Heat butter and minced onion until brown and top each serving. BACON POTATO SOUP RECIPE with chard If you want to know how to cook Swiss chard, this is a delicious recipe. It is a hearty soup and especially good in the cold weather. After cooking bacon, add onions to the drippings; cook until golden and set aside. In a large pot combine the ham hock, beef, water and salt; bring to a boil, cover, reduce heat and simmer 1 ½ hours. Remove beef from bone and ham from bone; discard bones and skim off fat. Return meat to the broth and add potatoes beans and garlic; simmer for 45 minutes. Add sausage, bacon, pepperoni and Swiss chard; simmer 15 to 20 minutes longer. NOTE: This can be frozen in small freezer containers. When you learn how to cook Swiss Chard this is a favorite recipe. Pierce eggplants with small sharp knife in several places. Remove from oven; REDUCE OVEN TEMPERATURE TO 350F degrees. Quickly peel pepper as soon as cool enough to handle. Remove stem and seeds and discard; allow any juices to fall into bowl. Cut red pepper into 8 rough squares of equal size. Peel eggplants and remove as many seeds as possible; keep flesh in thick strips. Drain in colander; cut eggplant into coarse chunks. Bring large saucepan of water to a boil; have ready a large bowl of ice water. Dip 3 or 4 large Swiss chard leaves into boiling water at a time holding by the stem until wilted about 30 seconds. Plunge wilted leaves in ice water; repeat with remaining leaves. Remove all leaves from ice water and drain on paper towels. Heat oil in a large skillet over low heat; add shallot and cook until softened. Add garlic and scallion and cook about 1 minute while stirring. Add tomatoes and increase heat to medium; cook and stir until most of liquid evaporates. Stir in reserved pepper juice, eggplant strips, lemon juice, rosemary and thyme. Season with salt, pepper and cayenne; transfer vegetables to a large plate and cool. Generously butter eight ½ cup ramekins. Cut any tough veins from the Swiss chard leaves; cut leaves in half lengthwise. Thickly line the ramekins with the chard leaves allowing 1 inch overhang. Put about 3 tablespoons of tomato eggplant mixture in each ramekin. Top with red pepper square pressing lightly. Cover with another 3 tablespoons of eggplant mixture using up remaining mixture. Fold the overhanging chard leaves over the mixture pressing lightly. Set ramekins in shallow pan; pour enough hot water into pan to reach half way up ramekins. Cover pan with foil and bake for about 20 minutes or until tip of knife inserted in center comes out hot. To serve invert ramekins on dinner plates and timbales should fall out easily.